• A #22 Clark bus passenger reported being victimized as they stepped off the southbound bus at Belmont around 5:30PM last Monday. The offenders were described as a male and female couple: The male is black with a grayish goatee, about 6-feet tall, 170 pounds, wearing a black jacket, and black pants. His partner is a woman, black, wearing a black North Face brand jacket. • On Wednesday, another victim flagged down police around 6:40PM at the Belmont CTA station to report being pick pocketed. No offender description was offered. 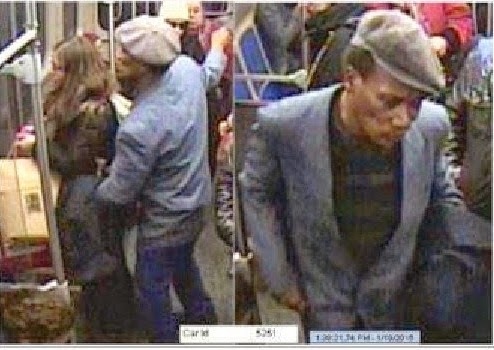 Photos of an alleged Red Line train pickpocket in action last month. The CTA has issued two alerts about North Side pickpockets since late November. The agency issued a series of pictures with its most recent alert on January 24. The photo series showed a pickpocket in action on a southbound Red Line train. And a late November police alert warned of pickpockets working as a team across several North Side stations. As CWB reported then, police strongly believe that they had one of the suspects in custody before the alert was issued. They had to let him go because a victim refused to file charges. Court records showed that the suspect, a career pickpocket, remained at large as of Friday. A Lincoln Park woman reported seeing an unknown man in her apartment last Monday, then discovered that he had taken her cell phone and credit cards during the visit. Police say the man entered the apartment in the 1000 block of Montana around 11:45AM, “smelling like booze,” and then fled upon being discovered. Offender description: male, black, about 18-years-old, glasses, short hair, black jacket, light jeans, carrying a backpack. Also on last week’s burglary list: 3600 block of Fremont. No force was used to enter the apartment.